It’s something that every manager or team leader wants to know: how do I get my team to work together as effectively as possible? And how do I motivate everyone? As a manager or team leader, it’s essential to have insight into what motivates a team or person. You get this insight by knowing what drives them. 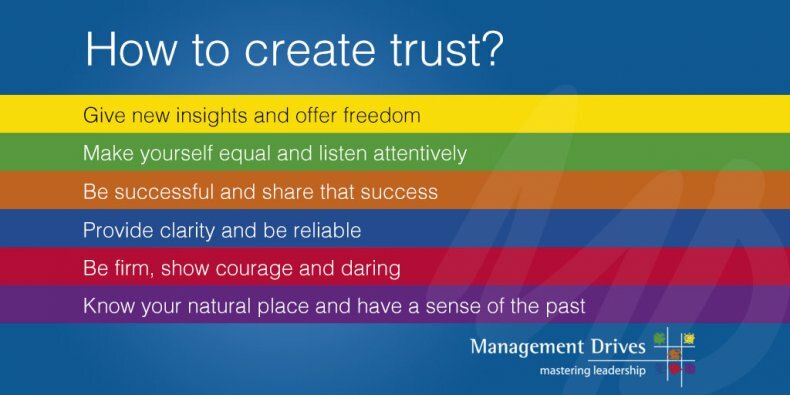 With this knowledge and insight, you can motivate your people better and increase trust within your team. Here are six tips to create trust and motivate people better. Ensure that the substance of processes is correct and well thought out. People with a lot of yellow want to analyse, understand and explore in depth. As a leader, you provide freedom in ideas and actions and create new insights. Make sure that there is a lot of attention to feelings and people. People with a lot of green feel that it’s important for people to be treated equally and that social connections and people are prioritised. As a leader, you make sure that you listen attentively and focus on people’s feelings. Make sure that you accept challenges and are focused on opportunities and possibilities. People with a lot of orange want to show progress, results and achievements. As a leader, you provide opportunities, give people visible appreciation and take people seriously. Make sure that there are clear agreements and that these are kept. People with a lot of blue want to create certainty and clarity. As a leader, you make sure that you keep to agreements and ensure fairness. Make sure that you manage people with strength and respect. People with a lot of red stand for courage, pace and power. As a leader, you make sure that you are decisive, show courage and stay strong. Make sure that you have a sense of natural relationships and the strengths from the past. People with a lot of purple want to create bonds and security. As a leader, you provide support and ensure pride, security and connection.